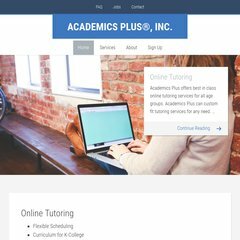 www.Academicsplusinc.com - Academics Plus, Inc.
academicsplusinc.com Apply to be a Tutor - Academics Plus, Inc.
On average 1.80 pages are viewed each, by the estimated 28 daily visitors. Take 2 Hosting Inc. California is the location of the Apache server. There are 4 DNS records, such as ns7.ocsdns.com, ns8.ocsdns.com, and ns1.ocsdns.com. The programming language environment is PHP/5.2.17. PING www. (204.74.208.86) 56(84) bytes of data. A time of 92.1 ms, is recorded in a ping test.